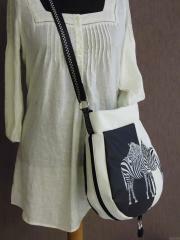 This is pretty textile bag made in monochrome color scheme. Its body is executed from dense dark fabric which makes it very convenient accessory for everyday use. 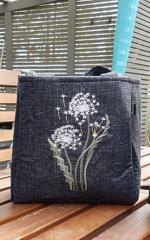 Its front side is decorated with Dandelions free embroidery design. Due to it this work piece looks very beautiful and well elaborated. It creates true feeling of hot summer with fluff of dandelions everywhere around you. If you want to be trendy you may choose the different ways to achieve your goal. One of them is to reproduce some stylish look with original accessories — for example red cap decorated with stars and bandana with skulls. Another way is to use the appropriate picture — such as Stylish dachshund embroidery design: it is the expressive symbol of trendy and advanced person who is not afraid to attract attention. On this picture you may see fragment of nice and convenient t-shirt which can be used both by boy and girl. 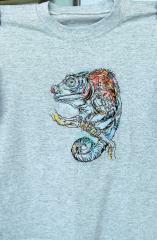 Its main charm is in Lizard on tree branch embroidery design. It is picture of wary amphibian sitting on tree and looking right at you. It seems to be painted by thin black pencil: this embroidery perfectly conveys graphic manner of drawing. 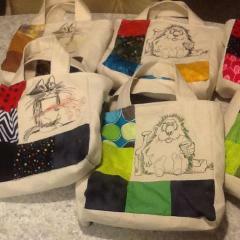 There is nice set of some textile bags made from pleasant cotton. You can use it as practical accessory for shopping and stylish element of your look at same time. Choose one which you like more or created your own design using our samples. They are Unhappy cat with flowers free embroidery design and Hedgehog free embroidery design. Both are funny and humorous. This is nice end convenient textile basket made by Ann-Kristin Kristofferse from dense fabric with quilted texture. It is useful thing for child’s room or cabinet because it is very suitable for keeping pencils, hair accessories or other little things. 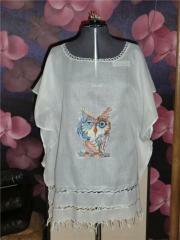 Its front side is decorated by Giraffe with yellow birdies embroidery design. 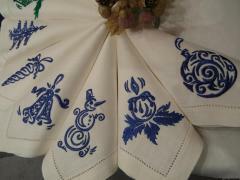 Main embroidery sample is added by little figure of frog with flower in its paws. 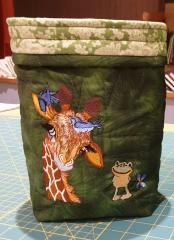 This is pretty little bag executed by Gerti Springer from dense cotton fabric. You may use it as small handbag or put it in your bag as purse. 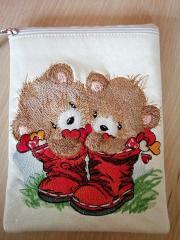 Its front side is decorated with Teddy bears in boots embroidery design. It is portrait of two cute little bears sitting in big boots. You have to smile looking at them. Embroidery can decorate your clothing and highlight your individuality, if you do not have a cute blouse with embroidery, necessarily to think about its purchase. Find this design Owl in color free embroidery design Embroidery allows you to create beautiful things and real paintings. 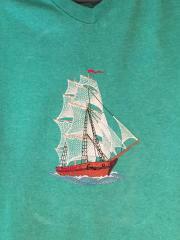 Depending on the theme of needlework, it can be used on various objects: clothing, home textiles, accessories design. Bright owl machine embroidery design, which can be embroidered on tablecloths, napkins, towels or women's blouses, shirts. 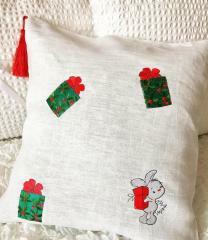 Embroidered products will be a wonderful holiday gift for relatives and friends. Handmade, made with love and taste - the most valuable gift. 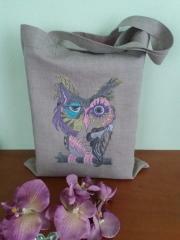 This fun owl of machine embroidery has one more magical property - the ability to transform. If you want, these bright summer colors will turn into autumn or even winter! For such a transformation it will be enough just to change the color sham of their use. On summer clothes, blouses and shirts, this bird design can play the role of Christmas. On bedclothes and pajamas she will turn into sleepy, descended from the fabulous northern sky. Well, on the Christmas attributes of home decor, floorwear and other holiday decorations, they will again become a northern fairy tale. 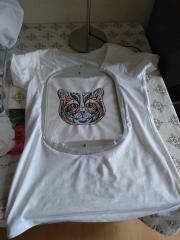 This picture visually shows process of transformation of simple cotton t-shirt into real work of art. 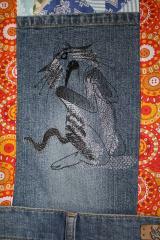 Here you can see final stage of work on Mosaic cat embroidery design on clothing’s chest. It is portrait of fluffy cat executed in original technique. Many little colored elements together create a muzzle of fat cat which reminds Cheshire. Author just need to remove hoop from t-shirt, iron it and go to walk! 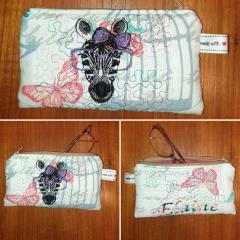 This is cool textile case for glasses made of dense cotton fabric. 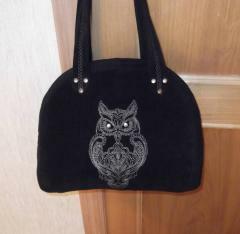 It is richly decorated with different embroidery samples such as curves, butterflies and even name of its owner. 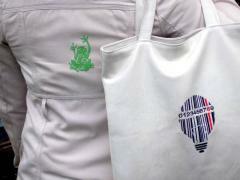 But main of these samples is definitely Zebra free embroidery design. Pretty work piece is added by tag with filled by love of its author and convenient zip at top part. Download here Cat like read book free embroidery design and Funny cute cat free machine embroidery design Author: Kathryn Daniella Farmer To make a series of bags for the beach with one style solution is a simple task, the implementation of which does not take much time. Computer machine embroidery makes it possible to perform high-quality embroidery in a matter of hours, without spending much effort. 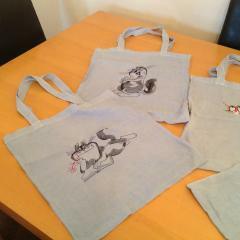 If you have an embroidery or sewing embroidery machine you can sew yourself a large set of bags for the whole family for a couple of evenings. Materials for making embroidered beach bags: Thick fabric (denim, thick cotton) Machine Embroidery Top Thread Machine embroidery bobbin thread Tear-off stabilizer glue Filmoplast Machine embroidery designs from the free collection "Funny cats"
This is fragment of bright striped fabric in traditional Christmas color scheme. It is embellished by interesting and definitely holiday sample. 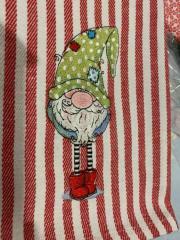 It is Gnome in polka dot phrygian cap and boots embroidery design. Background fabric and chosen picture create very interesting combination. 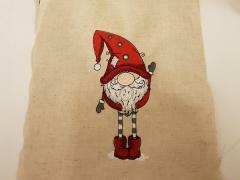 It will be good base for cool souvenir or other textile gift decorated with such funny embroidered picture.